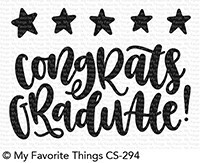 Congrats Graduate 3 5/8? x 1 7/8? Stars (5) each measuring approximately 1/2? x 1/2?